from the appearance of your vehicle? Both safety and aesthetics come into play when you’re dealing with foggy headlights on your vehicle. While less-than-bright headlights make your vehicle look older and less appealing, they also contribute to reduced visibility for you and other drivers. Buying new headlights is expensive. Let John Barnes Window Tinting restore your headlights and save you money! Headlight restoration is one of many services that John Barnes Window Tinting offers. We can enhance the overall appearance of your vehicle. 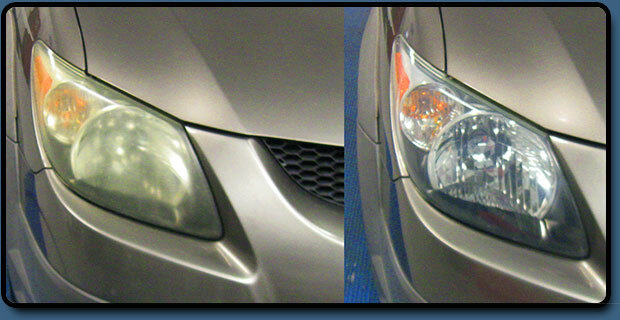 Our technicians are trained to restore headlights to their former brightness. John Barnes Window Tinting offers same-day headlight cleaning service in most cases as well as a full line of auto accessories from floor mats to steering wheel covers to even air fresheners.